15 and 16 June 2019 will be the fourth edition of North Sea Beach Rugby. Because of the official recognition of the Dutch Rugby Bond (Rugby Nederland) we can organize the Dutch Championship Beach 5s Rugby in the coming years. And not only for the men and women but also for U14, U16 and U18. This is important for the promotion of the sport in the Netherlands. Furthermore, the program has been expanded with a large youth tournament for under twelve years. The future for Beach 5s Rugby and the EBRA. Eventually, on Saturday 1200 players will play Beach Rugby with a total of 16 pitches. A beautiful sight. Nort Sea Beach Rugby not only wants to be for the top teams from Europe but must be a event for young and old, the whole family. A weekend where the sport Beach 5s Rugby is promoted in a positive way and motivates people to practice the sport. Furthermore we are in an advanced stage to let teams play from among others the Turn-Over project. These projects deal with problem youth and offer them a future through rugby. Last year we already had a team playing at North Sea Beach Rugby. And the reactions were very positive. Even more important than the result for the young people is the feeling of being part of the rugby family. To be accepted. Finally, I would like to say that December 15, North Sea Beach Rugby the first indoor Beach Rugby tournament for the youngest youth have. The idea is still small but in the coming years we hope to expand this. What could be better than playing Beach 5s Rugby in winter in a summer atmosphere. In the last meeting in The Hague necessary decisions were taken to make the EBRA more professional and more future proof. The adjustments were very much needed for North Sea Beach Rugby to be seen by the Dutch Rugby Bond (Rugby Nederland) and the Municipality of The Hague as a serious overarching organization and partner of North Sea Beach Rugby. The EBRA has been established as a neutral organisation by the upcoming changes. An organization that objectively looks at the developments within the Beach Rugby world and actively responds to them. And by the professional set-up seen as a serious discussion partner within the unions and other organizations. An association that is not only involved in the organisation of the European Beach 5s Rugby circuit, but is also involved in changes to the rules of the game. Also very important is that the participating teams, referees but also organizers of Beach 5s Rugby events know where they stand. The EBRA must be clear, open but also supportive. An association that stands for the Beach 5s Rugby and the associated core values such as respect, sportsmanship and where everyone counts. 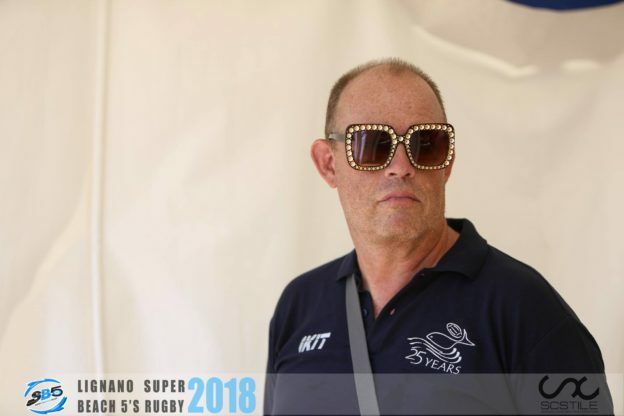 If all the changes and future adjustments have taken place, the EBRA and the Beach 5s Rugby will have a bright future in the Netherlands, Europe and beyond. The EBRA has a bright future. A future that is partly determined by the input and commitment of the organizers of Beach 5s Rugby. Points of attention are the further development of a consecutive tournament registration system. At the moment we are already working with such a digital system in the Netherlands. This will be further developed for all participating organizers so that the EBRA has all results, stands and the like in real time. Furthermore, we are currently looking at a player registration system for the EBRA circuit. This is still a big challenge that requires a bit more time. But in the end this must be done to be uniform as an organization. North Sea Beach rugby also wants to further develop youth rugby within the EBRA. And also make it possible for young referees to be trained to whistle Beach 5s Rugby. The EBRA should not only be busy with the present but also with the future. This entry was posted in News on November 5, 2018 by EBRA Admin.